Lowe Alpine’s 2010 Cerro Torre 65:85 TFX 10 (Torso Fit Expedition) backpack is a thoughtfully designed, internal frame, platform built to perform on multi-day treks with moderate to heavy loads up to 66 pounds. And deliver it does. We’ve had the Cerro Torre 65:85 on several alpine hikes where any lapses in pack comfort and durability would be revealed by the end of any one day on the trail. Check it out now for your consideration as this pack should be available by March 2010 or early spring. Cerro Torre is a top-loader pack designed with dual vertical aluminum stays providing rigid support for the internal frame to work with the TFX multi-adjustment suspension system. Fitting the Cerro Torre to your body type is a simple procedure. With the pack off, and the shoulder straps facing you, just flip the lumbar pad up, loose the buckle to slide the color-coded back-plate up or down to fit your torso according to the horizontal lines (Medium, Large, X-large) on the back-plate. Your torso measurement will appear in the buckle. Next you re-fit the lumbar pad and you’re good to go. Back balance is handled by the Torso Motion system designed to let the waistbelt move relative to your spine as the internal frame of the Cerro Torre TFX moves and rotates with your torso. As part of the TXF system, high performance foam inside the lumbar pad forms to the natural curve of your lower back, and the upper pads offer cushion to your upper back while allowing the pack to ride close to your body. Torso Fit Expedition (TFX) adjustment system shows lumbar pad, buckle, and back support. Cerro Torre can expand from 65-Liters of cargo space, to 85-Liters when you require more carrying capacity. This 20-Liter’s of extra/optional cargo space has closures at the top of the main pack compartment and at top of the pack extension. This double-collar closure system protects cargo (in addition to the top lid flap) whether the Cerro Torre TFX 10 is at maximum load capacity or not. The pack lid is removable, and the entire depth of the pack can be used for packing bulky gear, such as setting up a base camp where each person carries entire loads dedicated to food, tents, sleeping bags, water, etc. Zippered compartments at top, bottom, and the middle of the pack permit total access to gear without unloading the entire pack. At the bottom of the main pack, where your lighter load items should be packed, an ample sleeping bag compartment has enough room for a down sleeping bag and additional gear. For our trips, the sleeping bag compartment was loaded with a Sierra Designs Arrow Rock 30 down sleeping bag in its stuff sack, the new Therm-A-Rest NeoAire sleeping pad (very compact and light) as well as a down sweater and Adventure Medical First Aid kit. Bottom sleeping bag compartment held a Sierra Designs Arrow Rock 30 down bag, a Therm-A-Rest NeoAire pad, and then some. A separate sleeping bag compartment is a feature so many backpack designs don’t include, but it makes pack organization and protection for the sleeping bag so much more efficient, and allows you to keep potential spills or wet gear from your sleeping bag. The Cerro Torre TFX 10 comes with a rain-cover that stores in its own zippered pouch on the frame-side of the main pack flap. The rain cover has elastic material around its circumference to cling onto the Cerro Torre in whatever phase of load capacity it has onboard, with enough room to cover gear (there are exceptions) you might have lashed onto the outside. On the pack exterior, lash points and well-designed gear loops are located at every logical position you’ll need on the pack exterior for those treks where you’ll want to secure poles, ice ax, snow shovel, sleeping pads, or any piece of equipment that is not practical for storage in the main compartment. And without going through the top of the pack to get at gear, heavy nylon zippers on the central pack main panel allow you to get at gear inside the main compartment without unpacking the Cerro Torre. For example, if your stove is at the bottom of the main compartment and you need a mid-day cup of hot tea with your lunch, you simply lay the pack on the ground, straps-down, unzip the main compartment and pull your stove, cook kit, and food out. When it’s time to get back to the trail, you’ll replace the gear into the main compartment and zip it back up. The load cinching compression-straps with side-locking nylon buckles are easy to hook back up to keep your entire pack-load tight and secure; and you are on your way again. The Cerro Torre TFX 10 comes with its own onboard rain cover. That’s always nice to have. That’s another detail we liked about the Cerro Torre TFX, there are enough compression straps located at the sides, bottom and top of this pack to completely secure your pack load from wiggling or load-shifting . All the side-locking buckles, including the hip-belt, shoulder straps, chest strap, and all the load-securing strap buckles are constructed of lightweight composite materials which contribute to a light overall empty pack weight of about 6 pounds. To achieve this low empty pack weight-to-load carrying capacity, Lowe Alpine uses 1000-denier nylon, 600-denier ripstop polyester, and 600-denier hexagon-patterned polyester fabrics for the pack itself. However, because the lightweight nature of the side-locking buckles and nylon straps, you should pull the straps in a straight line to tighten, not just yank them at any odd angle. We did yank one of the load-tightening straps at an off-angle and broke it. You must take that into consideration with any backpack you choose to own. We’ve owned packs with heavy-duty side-locking strap connectors such as those found on the Kelty Trekker or the Gregory Spear (military) that are almost bomb-proof. But they add accumulated weight to the empty pack. There’s always a design tradeoff, and the buckles used on the Cerro Torre are plenty strong and durable long as you are conscious of how you treat them. Inside the main cargo chamber of the Cerro Torre, on the frame side, is a pocket for your water bladder along with a fabric hoop at top to suspend the bladder, and a clearly marked exit hole in the upper right side of the pack to thread the drinking hose through. We were using a 2-liter Camelbak water bladder for our trips, but the pocket will easily hold two 2-liter bladders or a 3-liter. This is merely another example of the design being thought out by a team that has been at it for several decades and tons of real-world testing experience to draw from. 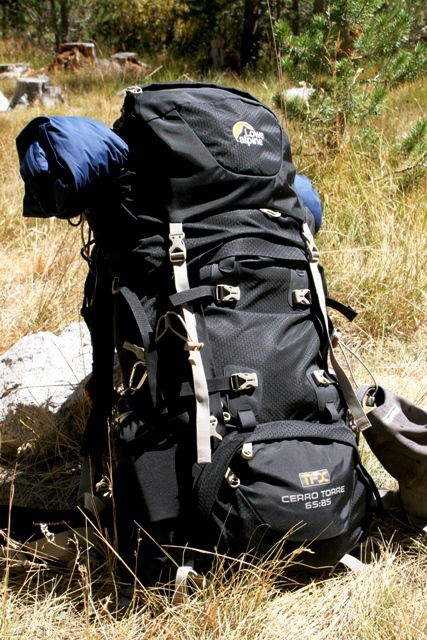 Different trip, different gear, the Cerro Torre TFX 10 is a comfortable long-haul backpack. Torso Fit Expedition lumbar and back suspension view. Another, zippered, pocket is located on the inside-front of the main cargo chamber for easy access from inside the pack or, by unzipping the front panel, the exterior of the pack to accommodate small, flat, gear items you want to keep separate from primary gear. At the bottom of the main cargo cavity, which is the top of the sleeping bag compartment, is a zippered false-bottom that you can open up and literally use the entire 85-liters (5,187 cubic inches) of the Cerro Torre volume capacity. We found that with the storage pockets on the inside, bottom, and top of the Cerro Torre, you have enough compartments to organize your gear without the need for exterior side pockets. On the exterior of the pack lid there is a large pocket for your map, compass, and quick access items. Another large pocket is available on the underside of the pack lid; with international distress signal procedure stenciled in clear instructions in French and English. The Lowe Alpine Cerro Torre TFX 10 packed great on the trail. On a 12-mile hike in the Sierra Nevada, the Torso Fit Expedition pack fit system is straightforward, allowing easy adjustment and fit-tuning on the trail. 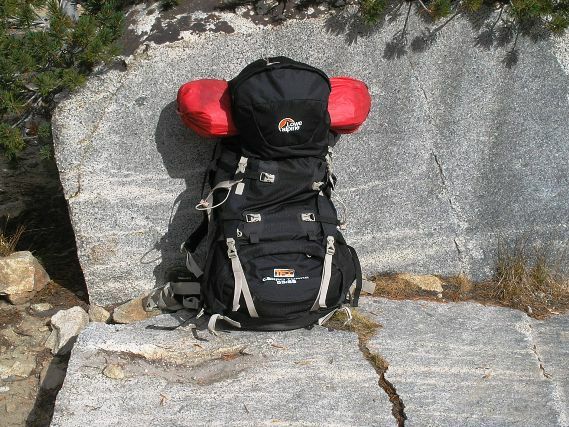 By extending the color-coded lumbar support adjustment to fit a long torso, this Cerro Torre, loaded with approximately 40 pounds, rode close to the body and distributed the pack weight across the top of the hip. There was no tendency to bind clothes or chaff the lower back skin when using a leather waist belt to hold up the Mt. Khakis Original Alpine pants. Working in combination with the adjustable hip pad, shoulder straps, and sternum strap, we found the Cerro Torre easy to adjust and cinch up while hiking with the pack on. On the trail, the Cerro Torre TFX 10 fit close to the body and did not bind or chaff, even in hot weather. The pack was loaded light at the bottom with the heavier items up towards the top. Compression straps are also located over the bottom sleeping bag pocket of the Cerro Torre. These two vertical straps not only allow you to cinch up to keep gear from moving around on the hike, but they also make a convenient place to hold your jacket or long pants once the sun comes out and you’re shedding clothes by midday. Whether it was due to incorrect pack adjustment, hunched shoulders, or shoulder-bulk, the shoulder straps seemed to taper too narrow, too quickly, from where they contact the top of the shoulder to the front of the chest. There is plenty of shoulder-strap padding where the straps are at their widest point; but that point was not where the pack rode on this trip, even when the shoulder straps where adjusted very snug. This is the one potential downside we observed with the Cerro Torre, but it’s a subjective observation for one individual that certainly will not apply to most body types it is designed to fit. Notwithstanding, the Cerro Torre TFX 10 handled the pack weight, had plenty of room and carrying capacity for more gear, and it was comfortable on a hike that was well above 10,000 elevation. The trail itself was rock-strewn and ascended at steep inclines in various places. Both the altitude and the trail were challenging enough to require significant physical effort. There were few trail sections where strolling upright was the norm, most of the time it required leaning into the trail, burning calories and hauling like a misunderstood donkey. 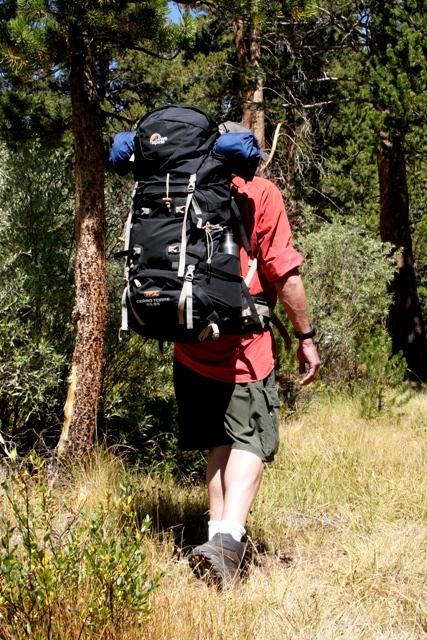 Burning calories and perspiration, especially in summer and early fall seasons, comes with the freedom of backpacking. The Cerro Torre torso and lumbar padding did a good job of wicking away sweat where the pack is in contact with your body. Deep mesh pockets on either bottom sides of the Cerro Torre held two EcoReusable stainless steel water bottles. This pocket shows the Benchmark Marc A. Lee Glory knife. A sturdy nylon loop at the inside top of the Cerro Torre and two nylon loops at both sides of the pack bottom facilitated getting the pack on and off, with or without the help of another person. When pack-loads get really heavy, it’s always a good idea to have a friend help you get into the pack or take it off, and those grab handles can come in real handy. The grab handles at the pack bottom are also good lash points for securing gear outside the pack, as are the other built-in lashing points you can employ to tie down your early morning outerwear, ice ax, or trekking poles when not in use. Two deep pockets at either bottom side of the Cerro Torre are convenient for storing water bottles, gloves, and anything else you want easy access to. 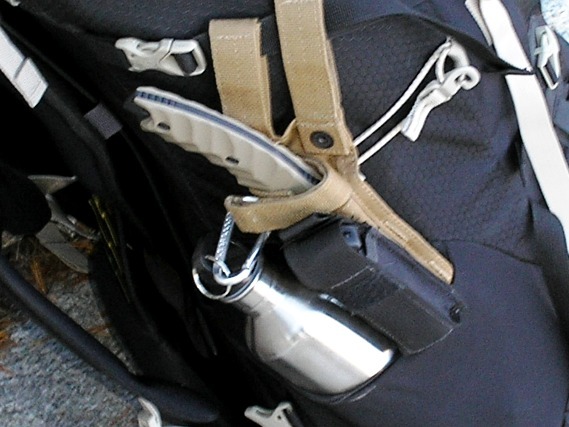 On this trip, two stainless steel EcoReusable liter-sized water bottles rode in these pockets and secured with small carabiners onto the compression straps outside the pockets. With the elastic pocket tops, the compression strap, carabiners, and deep pockets, there was no worry about losing the water bottles. We found the Cerro Torre TFX to be an extremely capable, multi-day backpack that is fully able to perform on long-mileage hikes. The pack is able to take on heavier loads, adjusts very well with the compression straps to secure the load and size-it down as you use up food or simply take it on an overnight hike with minimal gear. Because the upper, expandable section of the Cerro Torre uses dual enclosures to seal the top of the pack, we found this a great location for carrying a three-man Hilleberg Kaitum 3 mountaineering tent. Plenty of cargo room and enough pack adjustments for long trips made the Cerro Torre one of the best long mileage, internal-frame packs we have enjoyed this year. It’s a pack you can so easily adjust to fit several torso sizes that you can grow into it, if you are a youngster, or make it available to friends who want to get into backpacking and may not own their own backpack just yet. Asolo Lowe Alpine and the gear they produce are known for reliability and comfort. The new Cerro Torre TFX 10 is a backpack we will definitely take on future backpack and alpine trips. And you will be seeing this pack in the gear list on trail stories going forward. End of the day. We found this big flat rock to cook on and sort out the gear. A Hilleberg Kaitum 3 tent sits at top of the Cerro Torre TFX 10. Cerro Torre TFX 10 loaded up and ready to hike. Load range: 55 – 70 lbs. Great review on the pack, found it really informative. I’ve been looking for a bigger pack myself and this is one I have been trying to read more about, your review was one of the best.